(J) Well good morning. I wanted to introduce this podcast because we’re a year out from when we initially updated our web site, and now we’ve done another major two updates to the update. It doesn’t look much different on the outside, but there are several things about the web site that have changed. One, “Manna” now is featured on the web site with an archival calendar, which you can click into the days with calendar view. We’ve got a whole section for leaving comments and we’re really excited about that because we’re really wanting it to become a kind of a place of dialog and of community. You can look at the next and the previous, you can search by topics, and we’re just real excited about that and how that is all worked out. You can send it to a friend. In the “Manna in the Morning” that will come to your e-mail you’ll have at the bottom a link that will bring you into the “Manna” on the web site and you can, you know, enter that dialog, you can read past comments and you can enter your own comments. So we’re real excited about that. But another area that has changed just yesterday actually, the podcast that’s coming out today, you will be able to see that it’s completely different in that it functions now within Shulamite.com. We had hosted it at a different location and so you would, you know, go to that location to see the podcast and listen to the podcast. 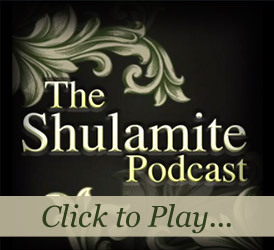 Well, we’ve now brought it into the Shulamite site. 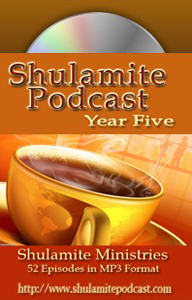 When you go to the ‘listen’ section of Shulamite.com, the weekly podcast pops up and there the five most recent podcasts are available. Plus you have a few more episodes, which you can go into the archives, and you can, you can look at any of the podcasts that have gone up. We’re keeping 2008 up. 2007 is of course available on CD-ROM. There’s two CD-ROM’s that comprise the first year 2007. And you can subscribe here via ‘iTunes’, or you can listen and watch it here. And another really neat thing that we’ve got going on is we’ve entered that ‘comment’ section so that you can do the exact same thing. We want it to be a place of dialog, of community. And so we’re really excited about that and are looking forward to seeing how that whole section is going to evolve. 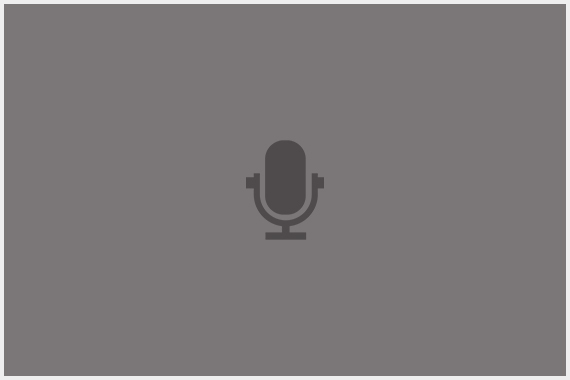 You can click into ‘listen to this podcast.’ It brings up the podcast; you see the image. Another really awesome thing is straight from the entry page of that particular podcast episode, it says: ‘read the transcription’, and you can click that and it just literally, it drops down the entire transcription of the podcast. Now, I want to tell you that it takes a day or two, or a little bit more for the transcription to actually come out because we have it being done by a lovely and wonderful friend of ours and of the ministry, and we just need to give that turn around time for it to be done. But it should be done and available usually by mid-week. So we want to bless you. I want to now go to the podcast. It’s a wonderful interview with Carole Nelson and we hope that you really enjoy it and are blessed by this continuing dialog about rejection. (J) Well, Martha we again are sitting in front of the fireplace and ah, today we have a special guest, we have Carole Nelson. And what has been going on is we have a number of people who are responding to the “Knowing God” booklets, and are having their lives impacted. And we just want to bring their revelation that’s coming out with these booklets because it’s just so powerful. And we had Jennifer, and now we have Carole, and there’s a number of e-mails that have come in basically telling us, we… you know, kind of put little feelers out there to say, how’s the book affecting you, how is it…? And we have just gotten an onslaught of, of responses back, of how people are being affected by… this is in particular “the Great Lie”. And so we have all of those comments placed up under the ‘review’ section, and I’m just real excited about what God is doing with this booklet, and with the booklets, and how He’s impacting lives. And then to be able to hear and see the blossoming of the fruit, it’s just exciting. (M) I have to confess, I think because it was spoken so long ago I wasn’t really expecting it to be so powerful, and I’m very, very, impacted and grateful that the Lord has, as you have said, birthed it again. (J) Well that’s the process I have seen, is that literally this was a message that was birthed back in the eighties, and then now it has gone through resurgence so to speak, and it’s now a brand new message with a new anointing, a new life, and Christ is just revealed in a different and stronger way. (M) It seems like that its time has come. Some of these messages, their time has come, now, and not then. (J) Well, we haven’t had it to do, ‘til now, you know? I have known these messages were awesome. We’ve placed them on the web site as ‘the essentials.’ They’re the essentials teaching. And, but we’ve never turned them into booklets, though we’ve had the transcriptions done for years. We have never brought it into that format, and it’s always been on our heart really, kind of. Hasn’t it been on your heart? (M) Well, sort of, but very much on the publisher’s heart. She’s been wanting it literally years, for it to be in booklet form. (J) Her desires are now being realized. (J) So I’m just real grateful for them coming out, and for the anointing and the additional anointing that God is placing on them; the different anointing. It’s not… it’s just different. The anointing is different on these booklets than on the tape. And the message is, you know… I’ve listened to them, literally gone word for word down and listened to them from the transcriptions and how they’re set up; it’s just taken Julie so much work, and so much time. And so I’m grateful for it because you can see when you listen to it and you read it, you can see the integrity of it. The message has been preserved. But that it was just to bring it into your style of writing was just such a really neat thing. So Carole, you had a revelation with Martha the other day, and you were speaking it to Martha, and I really want to hear your heart and what you were receiving from, I guess both “The Great Lie” and the podcast as well weren’t you. (Carole) Well, let’s see, I have… I have struggled with fear for years and years. And I’ve had seeming victories, temporary. But always, my fear would come back. And I’ve dealt with it, with the fear, mostly on the basis of just fear. And somehow this time, the beginning of it, after reading the booklet “The Great Lie”, we were all sitting and praying one morning and someone had gotten the scripture in Isaiah 28, which is 28:17-18. “Also I will make justice the measuring line, and righteousness the plummet. The hail will sweep away the refuge of lies, and the waters will overflow the hiding place. Your covenant with death will be annulled, and your agreement with Sheol will not stand; when the overflowing scourge passes through.” And when I heard that word annulled, it just, it just burst into my…into my spirit. And I really didn’t understand why, but I knew that there was something really big about that. And John, you had already started to get it, if I’m getting the sequence right, the revelation about that. And what you had seen already was just phenomenal, and it did affect me. But because of our Body-life, and because God has pulled us together in Body-life, I am just so grateful, because where I have chosen to make myself blind, He has been faithful through Body-life to, to confront me. And so I’ll just say I’m very, very, very grateful for that. So anyway, I started experiencing again this fear. I started going through fear again. And it was rough. And I, when I’ve gone through the fear, I feel the fear. It’s a, it’s a deep experience, it’s not something ah, ethereal out there, it’s something that feels very, very, physically real. (Carole) Tangible. Physically real, emotionally real, mentally real. And so, oh I went home and I just cried out and cried out to the Lord, and I began to see that what I thought that I was afraid of… And that’s where I have to start, because it’s where I thought, you know, I’ve just got to deal with where it is that I think. And I felt like the Lord was showing me that I felt… I was terribly afraid, terrorized that my authorities, and that God, would reject me. And so I wrote that to someone in the Body, and they said, “oh no, no, no, you have rejected God. And your family has paid the price of your, your rejecting them.” And I didn’t get it, ok, I didn’t get it at first. I really didn’t get it. But I heard it, and I took it back. I knew it was right, I knew it right, but I didn’t quite get it. And I went back to the Lord, and I was in, I just was in total despair. In fact, I believe it was the next morning, I called you about something, and you gave me a word. And you gave me a word from Watchman Nee, ah, “The Lord My Portion”, and basically, I don’t have it in front of me, but basically it said, when you’re dealing with something with the Lord, and it does not seem to lift or to be solved by fasting and prayer, many saints have found that if they rise up and they just say You are, You are Lord, You are King, You are Sovereign, and you can solve. I just began to, to rise up and say, You are Lord, You are King, You know me inside out and I don’t get this. I’m just in terrible anxiety over the fear, and I can’t do a thing about it, I can’t do anything. If I could just not have fear I would just not have fear. (Carole) I mean I’d go phffft….and it’d be gone. (Carole) But you can’t do it. And I began to cry out, and over hours, or I don’t know how long the process was… He began to show me that the fear, the fear was, it was a wall that I had built to protect myself, to save myself, from God; from God and all authority. And underneath that, underneath the fear, nestled underneath the fear was my blatant rebellion, my blatant lies to myself mostly, because you can believe anything you want to believe and you can stick it under there and hide it and the rest of it. And I’m talking lightly about it, and I guarantee it was not a, it was not a light experience at all. But I began to see; I just began to see a picture of what I had done. I have… I’ve been rebellious, rebellious since the womb. I’ve been a liar since the womb. But somewhere in there I decided that I would build a stronghold to protect myself, and that’s exactly what I did, and so it was supported not only by myself, but by, by demons. And I took that to the Lord and I just, I just cried out and I cried out. And I can’t tell you how it all happened, I can’t tell you. I was… it was so beyond me, and I was too weak to do anything about it, I was in total and absolute desperation. And I knew that unless God did something it was, it was ah, it was over. I couldn’t do anything about it and I cried out and I said to Him, I said, now, because my idea of You has been so skewed, I don’t even know who I’m talking to. So just to make this absolutely clear (John Laughs), I am talking to the God and Father of the Lord Jesus Christ, and nobody else, ok. And that is how I was with Him. Because I didn’t know, I really didn’t know, because I had so skewed Him and He was a god of rejection, I had built such a stronghold of rejection that that is what I moved out of. And I can tell you that, you know, I have surrendered, chosen to surrender and surrender and surrender, and I’ve chosen all these things. But when I was sitting with Martha she said something, I hadn’t seen this. She said well you probably even surrendered out of fear. And I said, I did! It wasn’t out of love; it wasn’t because I loved the Lord. I was too scared of Him. I was too rejected by Him in my mind. (M) You surrendered to save yourself. (Carole) Yes, that’s it, that’s it. (J) You know this really, it brings to mind the one talent servant, and how he built in the sand this little place where he put his talent, ah because he feared. And he was rejecting God. And the response from God is so violent that you think, oh, ok, there’s something behind this other than fear. This is a rejection of God. This, this man rejected God in his heart, that’s why God responded so vehemently against him.